​18 tracks: The 19th (Chris Finegan) * We Were Not Made For The Shadows (Yvonne Lyon, co-written by David Lyon & Yvonne Lyon) * Searching For Scotland (Ian McCalman) * Taste of Liberty (Findlay Napier) * Bonny Star (Gill Bowman) * The War of The Crofter (Brian McNeill) * We Must Unite - A Better Place For All (Simon Kempston) * Cronan a ‘Chamhanaich - Dawn Lullaby (Fiona J Mackenzie) * Scotland’s Future (Charlie Milne) * Duke Street to Jericho (Scott Murray) * Scotia Nova (Findlay Napier, written by Alistair Findlay) * The Road is Still Leading Us On (Yvonne Lyon, co-written by Yvonne Lyon & David Lyon) * The Pioneers (Duncan McCrone & Cy Jack) * An Exile Reflects - On Independence (Iain MacDonald) * O Man, Jock Tamson (Mairi Campbell & Dave Francis) * Nova Scotia - New Scotland (Frank Rae) * Yesterday and Tomorrow (Colin Donati) * It’s Up To You! (The Tolerated, written by Martin Watkins). In 2014 Luath Press published a book of poems, Scotia Nova - Poems For The Early Days of a Better Nation. 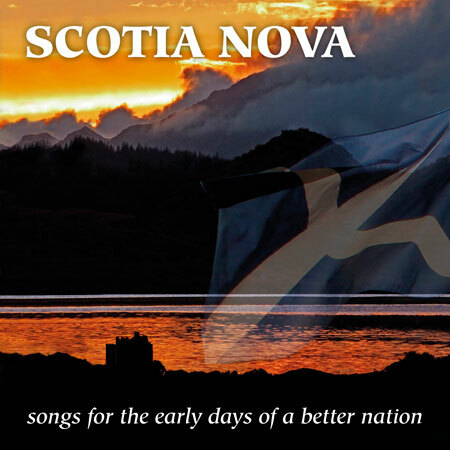 It seemed to make sense to release an album of new songs, Scotia Nova - Songs For The Early Days Of A Better Nation. A steering group of like-minded folk was formed: Mairi Campbell, Dave Francis, poet Alistair Findlay and Ian McCalman joined Gavin MacDougall of Luath Press and Ian Green of Greentrax. Invitations went out to songwriters who the group believed would be interested in the project. The response was tremendous and eighteen songs were selected and recorded, a wide variety of songwriting styles and singers. The songwriters include Yvonne Lyon, Fiona J Mackenzie, Gill Bowman, Mairi Campbell & Dave Francis, Finlay Napier, Brian McNeill, David Lyon, Scott Murray, Charlie Milne, Ian McCalman, Iain MacDonald, Alistair Findlay, Duncan McCrone & Cy Jack and more. Most songs are sung by the writers but in a couple of instances writers invited other singers to interpret their work. This is a truly unique and remarkable project and many of the songs are likely to find their way into Scotland’s song tradition. The album was launched at a Celtic Connections concert of the same name in the GRCH Strathclyde Suite in January 2016.